This week I am on the road for work. On Sunday I took stock of what was in my refrigerator that Ranger Sir would not use while I was gone. In general that is an easy question, vegetables. He does not turn up his nose at eating them if I fix them, but they are not on his top ten list of things he would take to a deserted island. Pattypan squash became two mini loaves of zucchini bread. One to keep and one for the freezer. Bananas became 3 mini loaves of oat bran bread. One to keep and two for the freezer. mango, pears and plums went on the dehydrator for my next granola. I threw the last of the yogurt in the strainer. He will used strained yogurt in place of sour cream on potatoes. He started the week with a relatively empty refrigerator that goes perfection with toast cheese, tomato soup, crock pot dinner and whatever else his heart desires. He had two quick breads to satisfy his sweet tooth. Sometimes you just have to take a step back and attack your problems differently. 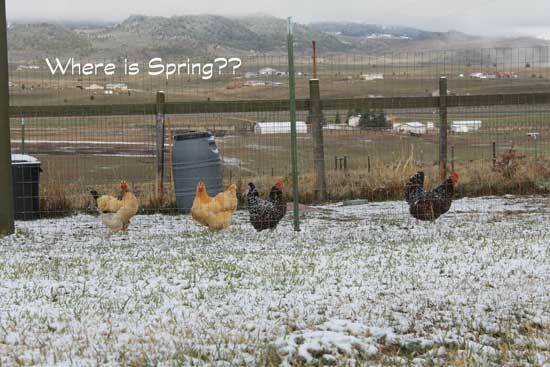 I live in a spot in Montana where it semi-arid, and the growing season runs from late June to sometime in September. Frost is common in July and August. Our farmer’s markets reflect the problems stated in number 3. Our grocery stores, though national chains, reflect a 60’s produce selection. If you don’t shop on a day the truck comes in the produce is just so-so. Frozen veggies require more thought. It easiest to pull them out of the bag and throw them in the steamer. Steaming and serving gets pretty boring pretty fast. Dollar for dollar on a per serving basis fresh is more expensive. Those of you following my blog, know that I recently started participating in Bountiful Baskets. It is a traveling delivery co-op system. 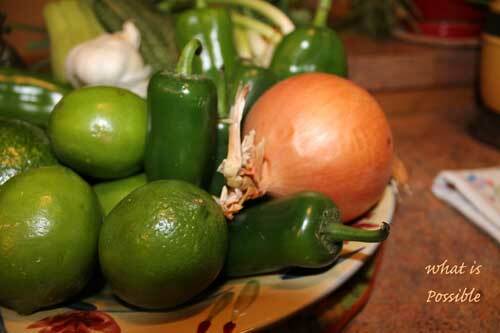 It allows us to purchase a basket of fresh veggies and fruits and a reasonable price. The downside is that you don’t know what you will get in your basket until you pick it up. If you are willing to go outside your normal comfort zone it is a great way to get those three veggies in you dinner menu. My husband is even getting into this. Friday he made sandwiches for lunch and proudly announced he had included 3 veggies. It is a sign that this goal of ours is finally becoming a normal reality for us, not just me but both of us. Changes happen slowly, but with persistence change can become your reality. Regular basket for this week. This week my Bountiful Basket included lots of fun goodies and only one of them may me think hmmmmm. Collard greens. I have never made or even tasted them in my entire life to my knowledge. So I will be searching for a recipe on the net. My husband said he is sure that Paula Deen has something that will use them with lots of bacon and butter. Those two fats can make anything yum! This week I ended up with a “conventional basket” (non organic). I really feel like I got quite a stash for only $15. 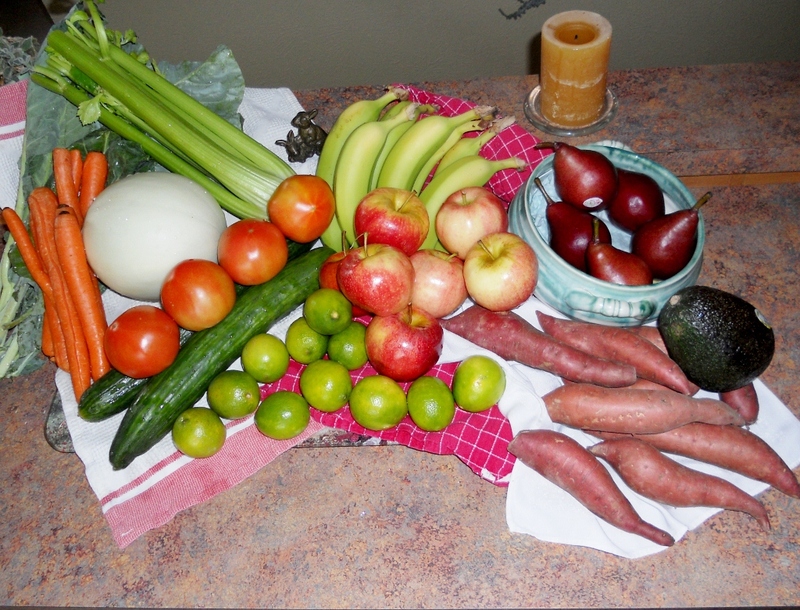 Look at the picture to see how much produce we ended up with. I am discovering it really is quite a challenge to get all my fruit ate. Last week my DH had to bring a treat to work and he made a banana cake with a white cake mix. We still ended up freezing a few mashed banana’s and now we start again. We did freeze some cauliflower as well. Tonight we ate a leftovers with homemade Margaritas on the rocks. So we started already on the limes. I grilled some mixed veggies as well. So started on basket even on the first day. Tomorrow will start menu planning to work on getting meals that utilize as much of our stash as possible. I am not a honeydew melon eater so will likely share that with others. Two English cukes is a lot and so will send one of those on as well. Beyond that even if I am gone for three days lets hope that we can get through this all before we need to decide if we are in or out for the next box. Let the next two weeks journey into healthful eating start.